At Spring Dental, our entire staff is dedicated to exceeding your expectations. We look forward to helping you in your dental and oral health needs. Meet the team who will make your dental experience a pleasant one. Dr. Ali was born in the United Kingdom and later moved to Canada when he was sixteen. He completed three years towards a mathematics degree at the University of British Columbia before getting into dental school at the University of Alberta. He received a Bachelor of Medical Sciences in 2003 and Doctor of Dental Surgery with Honors in 2005. 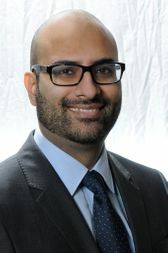 Dr. Ali worked in private practice as an associate dentist from 2005 until 2013 in New Westminster, Vancouver and Delta (all in British Columbia). He also taught in the clinic to dental assisting students at CDI College for four years while he was living in BC. He and his family moved to Wetaskiwin in 2013. Dr. Ali’s many interests include restorative and preventive dentistry. He always tells his patients “an ounce of prevention equals a pound of cure.” In his spare time he enjoys swimming, yoga, trying different cuisines and spending quality time with his family.